NOTE: Curriculum and policies are expected to change for Fall Semester 2019-2020. 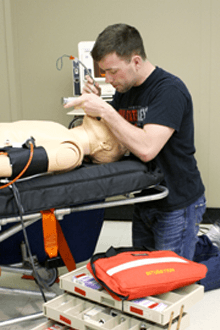 Belmont College offers the Paramedic Transitional Nursing curriculum in which a Certified Paramedic has the opportunity to enter the Associate Degree Nursing (ADN) program. Following the Paramedic Transitional Nursing semester, the Certified Paramedic can pursue an Associate Degree in Nursing and become eligible to take NCLEX-RN. Applicants may be Certified Paramedics from other schools, as well as from Belmont College. Class size is limited to space available in the ADN program. Provide proof of current licensure/certification as a paramedic. The licensure/certification must be current and unrestricted as of the first day of class. While it is recommended to maintain the licensure/certification, it is not a requirement to do so after the first day of class. Meet Belmont College’s criteria for admission including admission testing, and any developmental courses as identified by the college’s admission testing. Meet the ADN criteria for admission including current physical exam and immunization for on file (within twelve months prior to the date of application. If a student does not submit the required health and physical information prior to the first day of class, the student will be removed from the program. Current American Heart Association for Health Care Providers. It cannot be the CPR for lay rescuers known as BLS Heartsavers. If a student does not provide proof of a current CPR card prior to the first day of class, the student will be removed from the program. Questions? Contact the Nursing Advisor at 740.699.3820. Determine caring interventions for people to enhance readiness for self-healing, self-discovery, and self-control. Analyze the effect of various forms of communications on people as they interact in an ever changing environment. Determine evidence based decision making utilizing specific nursing knowledge, judgment, and skills in the provision of nursing care. Analyze risk reduction behaviors to maintain safety and structural and functional harmony. Differentiate appropriate behaviors of people to promote physical psychosocial and spiritual health and well being. Analyze the specialized knowledge, judgment and skills of nursing to develop a plan of care to meet human needs. Delineate and maintain appropriate professional boundaries in relationships with people. Utilize effective management and delegation techniques, in collaboration with other members of the healthcare team, to assist people to move towards positive outcomes.